The first Studio Ghibli film I experienced was Spirited Away after it won Best Animated Feature at the 75th Academy Awards in 2003. I was instantly enchanted by the multiple worlds created by filmmaker Hayao Miyazaki filled with lush visuals and complex characters. This was a different kind of animated movie; it was profound and beautiful and I had never seen anything like it. I was eager to see more and my husband and I immediately researched all the films that the studio and Miyazaki had made and filled up our Netflix queue. For most of that year, we were waiting with anticipation for the next DVD to come in the mail. The next year Ghibli would release Howl’s Moving Castle which became my most beloved of more than a dozen much loved films. Gorgeous and magical, with an engaging story, the film is populated with quirky and delightful characters. I was already hooked, but after Howl’s Moving Castle, I became one of many Ghibli fanatics. I’m not the only person who is passionate about Ghibli films. Here is a link to a recent New York Times article ranking my favorite studio’s films. The article mentions that Spirited Away ranked #2 of The 25 Best Films of the 21st Century So Far. As our family grew, we introduced our children to the animated films we had discovered as adults. Our kids delighted in them just as we did and have wanted to watch many of them again and again. That is one thing that is so special about Ghibli films. Almost all of them appeal to children and adults alike. None of the films rely on barely disguised adult humor, frenetic sights and sounds, or silliness to keep parents or kids from getting bored. There is a greater respect for the audience’s, intelligence, curiosity, and attention span and an assumption that we can appreciate not only the complex, magical and epic but also the beauty in simple things. These films our children love address subjects such as war, greed, ecology and sickness, presenting truly believable worlds not only through exquisitely drawn landscapes, but through honest portrayals of life which serve to anchor the magical elements that exist in most Ghibli films. The stories include strong character development, often having children as protagonists, overcoming obstacles, building meaningful relationships, and growing in self understanding and confidence. Last year, I couldn’t have been more excited when I found out that these Japanese films were going to be released in American theaters. This year distribution company GKIDS in conjunction with Fathom Events is continuing the successful Ghibli Fest. Several lovely films were presented on the big screen this spring, but it’s not too late to get in on the experience this summer. Today and Wednesday at 7 p.m. at both AMC Festival Plaza 16 and Chantilly 13, Porco Rosso is showing. Tickets cost between $12.50 and $13.75. 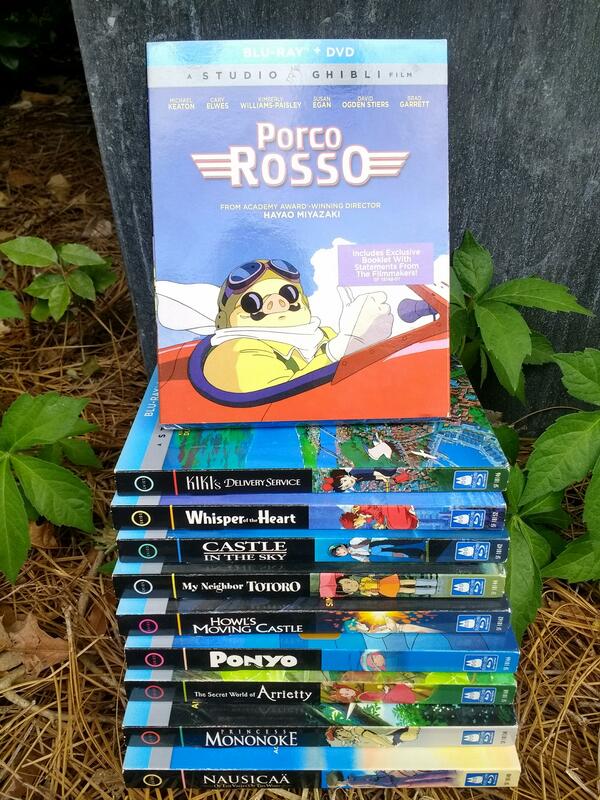 Porco Rosso is one of my favorites. The film, which was released in 1992, takes place in romantic settings in the Adriatic Sea and Milan, featuring a great respect for early aviation which is a fascinating and repeated theme in Miyazaki films. A gruff but lovable seaplane pilot and Italian World War I ex-fighter ace seems to be living an unapologetic life, the most unusual aspect of which is the curse that has turned him into an anthropomorphic pig. It is a poignant story about how others see us and how we see ourselves, with subjects such as grief and regret in the context of a warring world. There is humor and sweetness, and several strong female characters who play important roles in the story — a spunky, young engineer and the confident, successful woman who runs the hotel and restaurant Hotel Adriano. Following Porco Rosso, in June you can see Pom Poko which is directed by Ghibli co-founder Isao Takahata rather than Miyazaki. The films continue with critically-acclaimed Princess Mononoke in July and heartbreaking Grave of the Fireflies (also by Takahata) in August, which is one of the few Ghibli films that might be too heavy for children. In September, don’t miss My Neighbor Totoro. Totoro is Ghibli’s most iconic character and is on the studio’s logo. Spirited Away is in October; and finally adventure story Castle in the Sky is in November. I hope that during the next six months you will find the time to watch a Ghibli film either at home or in the theater and that you too will find it captivating.